I’ve wanted to build an AD-5 for quite a few years. The original impetus came when I was in VMA-331 and used to look at the pictures in the hallway outside the admin offices of all the planes 331 had flown in its history. 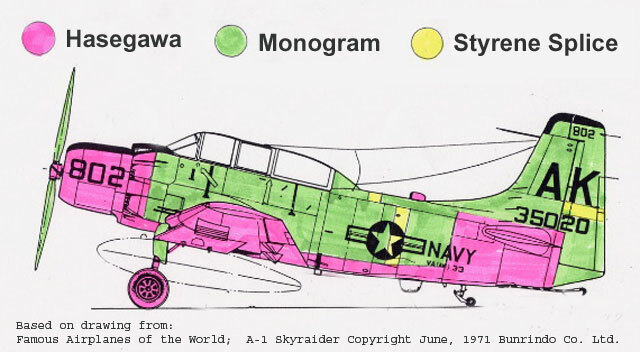 There, sandwiched in between the Corsairs and the Gull Gray and White AD-6s, was a picture of Gloss Sea Blue AD-5s with 331’s original tail codes of “MP” (331 changed to VL with the AD-6, and kept that code through AV-8Bs and the Gulf War, after which the squadron was decommissioned). 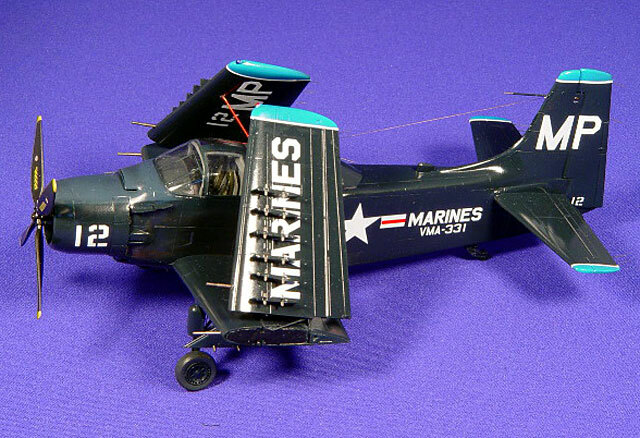 At around that time, I built the Monogram AD-6 kit and made up some 331 markings, but never got around to buying the Matchbox AD-5 that was in the hobby shop. Fast forward a dozen years to Shizuoka 2002. I was able to buy a bagged, instruction-less and decal-less Monogram AD-5 for 100 yen from the Hasegawa booth. A quick look at the parts convinced me that the kit needed a lot of details added for me to be happy with it, so I went back and bought Hasegawa’s AD-6 as well. I forget how much I paid for it, but it was pretty heavily discounted. I laid the fuselage halves together. And proceeded to mutter curses. The Hasegawa fuselage was about 3-4mm deeper than the Monogram. When I lined the two up at the front end, putting the exhausts in line with each other, they came out to almost exactly the same length. Our club president, by coincidence, bought the Skyraider In Action book while we were in Shizuoka. I borrowed it, took a quick look at the stated measurements, and as I had thought the –5 was longer than the –6. However, when I put the Hasegawa fuselage halves together and then the Monogram fuselage halves and compared, the two fuselages were the same width. Perhaps this project could be saved after all! I photocopied the three-views of the –5 and –6 from the In Action and threw everything in my pack for the trip home. Once home, I started digging around on the Internet and found Tom Cleaver’s article on bashing the Matchbox and Tamiya kits. I thought, “Hey, if TC can do it, so can I.” I also found an old edition of the Famous Airplanes of the World volume on the Spad. This had good –5 drawings (the newer edition doesn’t have them, unfortunately), and armed with two sets of drawings, a printed-out copy of TC’s article, both kits, saws, knives, sheet styrene, old sections of sprue, adhesives, putties, garlic, holy water and a large wooden stake and hammer set, I rolled up my sleeves and went to work. The initial stage of building up the fuselage halves went a little easier than I expected. I pretty quickly determined that the –5 and –6 were the same length from the cowl to the rudderpost. The extra length was due to the bigger rudder and the tail extension under it. This meant I could use the Hasegawa fuselage as a “base” and adjust/tack on bits of the Monogram fuselage to fit. I started by cutting vertically through one Hasegawa fuselage half just behind the depressions for the exhausts, stopping about 4mm short of the belly. I then cut horizontally back towards the tail, stopping just in front of where the horizontal stabs would fit. I then cut vertically down just in front of where the stabs would go and removed this section. I then cut off the vertical stab just above where the horizontal stabs would go, and removed the entire rudder. This left me with the nose and cowl, the belly and about 4mm of the lower sides, and the area around the horizontal stabilizers. I then proceeded to cut up a Monogram fuselage half to fit. I cut the nose off just behind the exhaust depressions. I then cut off the belly, being careful to remove only the belly section and leaving the sides intact. The rudder was carefully removed, then the triangular tail extension under it. Using some of the raised panel lines as guides, I cut the fuselage sides vertically about halfway between the aft edge of the cockpit opening and the horizontal stabs and then cut through the spine at the panel line in front of the vertical cut and connected the two with a horizontal cut. Doing it his way enabled me to “slide” the tail section back while using the spine overlap as an alignment guide. I then focused on lining up the front half of the Monogram fuselage half within the Hasegawa “frame”, then lining up the back half of the Monogram fuselage half using the rudderpost as a guide. After much dry fitting, trimming, dry fitting again, trimming and filing again and so on, I got the two Monogram fuselage pieces lined up with the Hasegawa “frame” and with each other. Even better, the “Frankenraider” was matching the drawings! I then glued everything together adding sheet styrene reinforcements on the inside of the joints and set a badly mangled looking port fuselage half aside to dry. And it had only taken me about 3 hours! The next day, once I was sure all the joints had set, I set about making the starboard fuselage half. This went much faster as I had the previous night’s experience to draw on as well as a built-up port fuselage half to align things against. I was able to get things cut up, repositioned and glued back together in only about an hour and a half. Since things went so quickly, I turned my attention to the wing. Three things need to be done to the Hasegawa wing to backdate it to –5 standards: the wheel wells need to be redone as –5s didn’t have the clamshell-like doors over the wheel. The opening was just a round hole a little bigger than the wheel itself, and the front opening (around the strut) was a little narrower. Sheet styrene and putty fixed this. Next, the catapult bridle hooks need to be filled in and sanded smooth. Finally, the armor plate on the belly needs to be sanded off. I was hoping this third step wouldn’t really be necessary, but after consulting with He Who Knows Things Gloss Sea Blue, Snake, I realized the armor would have to go. Now, at this point true Skyraider fans will be saying, “What about the oil cooler exhaust doors?! ?” Yes, they have to go as well, but since they are represented by depressions in the armor plating, when you remove that you solve the problem. I filled in the depressions around the catapult bridle hooks with superglue and as soon as it had set I broke out the coarse sandpaper and started sanding. After about half an hour sanding with progressively finer grits, the wing center section was fixed. 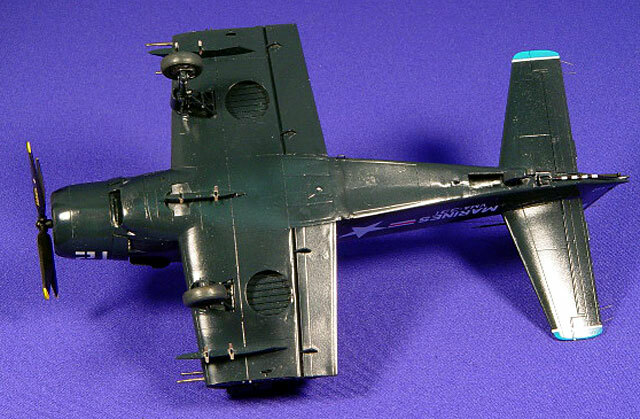 About this time it began to occur to me that the Spad is a BIG plane, even in 1/72. After thinking things over and taking a look at a bunch of pics, I became convinced that it would not be too much work to scratch build wing interiors and fold things up. So I cut the wing pieces along the fold lines, routed the edges thinner and cut and shaped some sheet to fit the openings. I backed up the sheet with epoxy putty on the inner sections so I would have a base to stick the brass rod I was going to use as hinges into. Some more thin sheet was added to detail up the area, and the canvas covers on the inner wing sections were made out of crinkled lead foil cut to shape. Pretty effective, I think. OK, back to the fuselage – after the intake in the vertical stabilizer leading edge was filed out, the halves were joined, gaps between all the pieces were filled with sheet styrene and putty and the area in front of the windscreen and around the nose intake was built up with Milliput. The tail extension that goes under the rudder was cut from what was left of the Monogram fuselage and attached to the “Frankenraider.” I also replaced the ADF fairing on the spine with the more accurate (IMHO) one cut from the Hasegawa kit. After sanding everything back out I scribed new panel lines and primed. Pinholes everywhere! Oh well, more Mr. Surfacer was slathered on, and when dry sanded smooth again and reprimed. Pinholes in whole new places! This went on for over a week before I finally got everything looking OK. In the meantime I had broken down and bought the Cobra Company interior, and Rex Barker had kindly provided me with a Falcon canopy set that included a replacement for the Monogram canopy. Things were looking up! I painted and installed the new cockpit – only a little bit of grinding was needed as well as a small amount of Milliput around the front of the coaming. A gunsight reflector was added from a small disc of clear sheet. I carefully cut out the Falcon canopy pieces, briefly debated opening the sliding pilot’s and NFO’s sections, decided against it and test fit. The canopy fit the fuselage fine, but there was a large gap between the top of the cockpit bulkhead and the canopy! What happened? Then it dawned on me – the cockpit set was designed for the Monogram kit with the Monogram canopy. I had originally test-fit the cockpit tub to the fuselage using the kit canopy, and though I found the bulkhead needed a shim under it to fit tight I hadn’t shimmed it up to fit the Falcon canopy (which I didn’t have at that stage anyway). This is not a flaw in the Cobra Company set by any means – I was using it in a way it wasn’t intended to be used. What I finally settled on was to cut the glass sections out of the Monogram canopy and attach the frame to the fuselage, then trim and file the frame to fit inside the Falcon canopy. Actually, this made things look more realistic as the AD-5 had a large beam running down the center of the canopy. Once the canopy problem was worked out I attached the wing center section – only a tiny amount of puttying and sanding was needed at the aft edge on the belly and around the nose. I also attached the horizontal stabs and landing gear. The main struts were detailed with bits of wire, rod and styrene to represent the brake lines and retraction mechanisms a little better, and bent and shaped brass rod was attached to the front of the struts to represent the catapult bridle hooks. I also replaced the cannon barrels at this point with new ones made up from telescoped brass tube, and once I was sure most of the sanding was done I used more brass tube and wire to make a new pitot for the vertical stabilizer. Only one more bit of rework needed before final assembly and painting: the rudder. Since I had made the fuselage about 3mm deeper, the rudder was now 3mm too short! I cut the left and right halves apart and inserted a splice to lengthen them, then taped the halves to a sheet of glass to keep them flat while the glue set up. When they were dry, I glued them together, built up a new leading edge from Milliput and filed and sanded away until everything looked OK. New trim tab actuators were made from bits of stretched sprue. Apparently I went wrong somewhere on the tail end, because the rudder ended up slightly narrower in chord than the extension under it was long. I finally decided to just mount the rudder deflected to effectively camouflage the disparity. Brass wire was inserted into holes drilled in the rudder’s leading edge to add strength to the joint. Now the canopy was installed and faired in, the blade antenna on top was taken from the Hasegawa scraps and installed, centerline and inner wing pylons installed and landing gear strut covers installed (these were taken from the Monogram kit after I filed off the USAF-style landing lights). After carefully drilling very tiny holes in the aileron, elevator and rudder trailing edges, static discharge wires were added from fine monofilament and trimmed to length. Then the horizontal stabilizers were installed. I left off the cowl flaps to ease painting of the drilled-out exhausts later. I also left off the outer wing pylons for now – you can’t apply the decals with them in place. Once the canopy was masked off with Scotch tape, I gave it a quick shot of black, and then began painting the whole model Gloss Sea Blue (Gunze’s “Midnight Blue”). The anti-glare panel was painted Gunze’s “Navy Blue” to represent the Non-specular Sea Blue actually used. Some areas required a light sanding with 2000 grit to smooth out imperfections and were then touched up. Detail painting of the exhausts, pylon sway braces, lights and so on was also done with Gunze paints, and the whole model was given several light gloss topcoats (except for the anti-glare panel). In between paint sessions, while everything was drying, I turned my attention to the propeller. 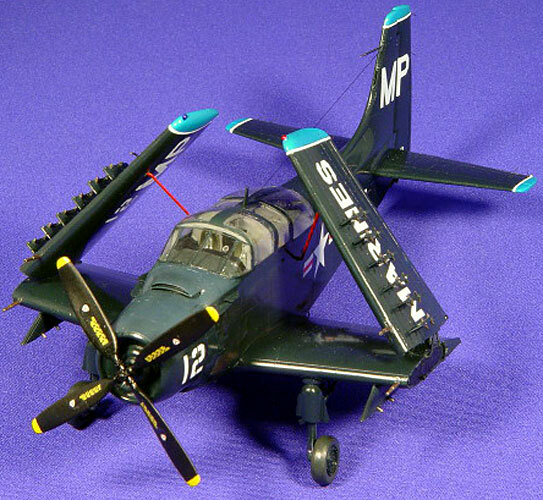 Hasegawa got the blades all wrong – they narrow towards the tips, whereas Skyraider props were of more-or-less constant chord all the way out. What I eventually settled on was using the Hasegawa hub (which was much better detailed) with slightly reshaped Monogram blades. The Monogram blades were thinned towards the tips and slightly squared off. It really didn’t take much, and yes, the propeller is now a teensy bit too small in diameter – sue me! When everything was smoothed out the prop was painted black and glossed. Decals came mostly from Superscale Corsair sheets. Some rearrangement was needed to make the “MP” and “VMA-331” codes. The modex number was chosen because frankly, that’s what I had enough of the same-size numbers on-hand of! Once the decaling was done, another gloss topcoat was shot to seal everything, and the masking was taken off the canopy and glare shield. Final bits were installed (cowl flaps, wheels, arrestor hook and outer wing pylons, the underwing pitot was replaced with shaped brass wire as the original went to the Antipodes somewhere along the line). Then the outer wings were installed while checking the wing-fold angle against drawings. Jury struts were made out of brass wire and installed. Hinge and actuator detail was added to the wingfold areas with more brass wire, and the radio aerial added from monofilament. And just in time for Shizuoka 2003! Granted, my “Frankenraider” was not the most attention-grabbing model on our club’s table. That honor went to a motorized Miss America P-51 (hint: spinning flashy things pull people in). Still, there were a few people who knew that Hasegawa has never released an AD-5 in 1/72, let alone one with a folded-wing option, and those people spent a lot of time dodging Miss America’s propeller to get a closer look at the “Frankenraider”. That made the whole thing worth it.